Cut everything on your plate with ease. The best knives worthy of the finest cuts of meat. Options for every family table and occasion. Versatile and dependable, it's a gift you know they will love. 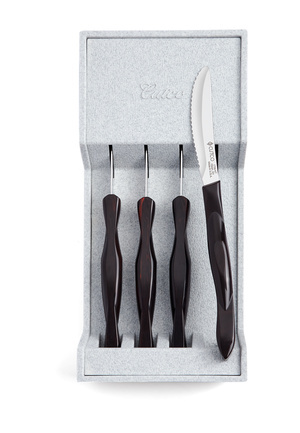 Set Savings of $7 $347 $354 if items purchased separately Six of Cutco's best-selling knives in a gift box. Cut everything on your plate and slice through even the thickest chops with ease. Stays sharp for years. A beautiful gift. Can be engraved. 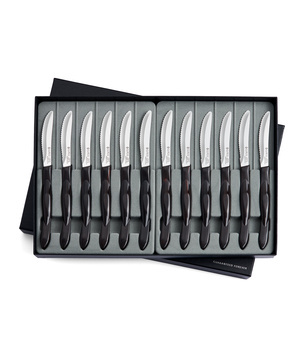 Set Savings of $13 $695 $708 if items purchased separately Twelve of Cutco's best-selling knives in a gift box. Cut everything on your plate and slice through even the thickest chops with ease. Stays sharp for years. A beautiful gift. Can be engraved. $160 Four of Cutcos best-selling knife in a gift box. Cut everything on your plate and slice through even the thickest chops with ease. Stays sharp for years. A beautiful gift. Can be engraved. 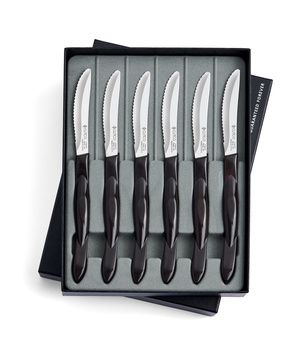 Set Savings of $12 $172 $184 if items purchased separately Four of Cutcos best-selling knife in a dishwasher-safe tray. Cut everything on your plate and slice through even the thickest chops with ease. Stays sharp for years. 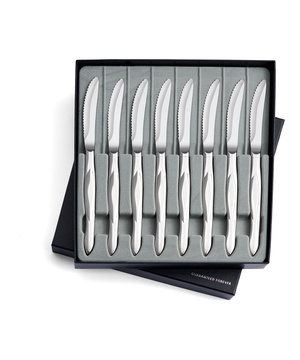 From dining room to patio, bring this tray of knives with you to every meal. Store tray on the wall or in a drawer. $231 Four of Cutcos best-selling knives in a gift box. Cut everything on your plate and slice through even the thickest chops with ease. Stays sharp for years. A beautiful gift. Can be engraved. 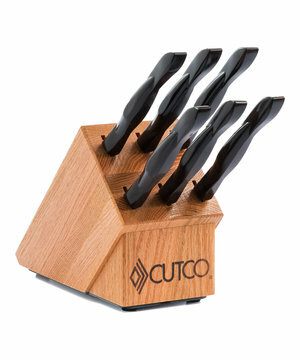 Set Savings of $24 $409 $433 if items purchased separately Eight of Cutcos best-selling knife in a Honey Finish Oak Block. Cut everything on your plate and slice through even the thickest chops with ease. Stays sharp for years. 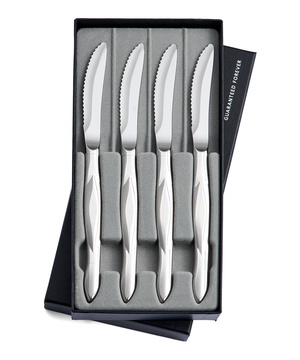 From dining room to patio, bring this block of knives with you to every meal. 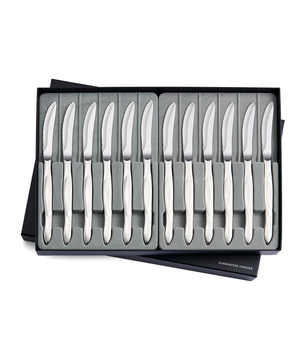 Set Savings of $8 $320 $328 if items purchased separately Eight of Cutcos best-selling knife in a gift box. Cut everything on your plate and slice through even the thickest chops with ease. Stays sharp for years. A beautiful gift. Can be engraved. 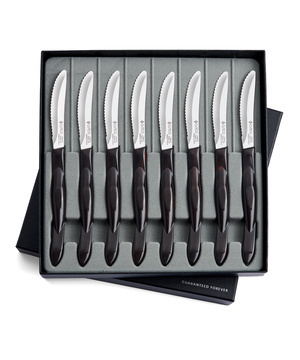 Set Savings of $9 $463 $472 if items purchased separately Eight of Cutcos best-selling knives in a gift box. Cut everything on your plate and slice through even the thickest chops with ease. Stays sharp for years. A beautiful gift. Can be engraved. 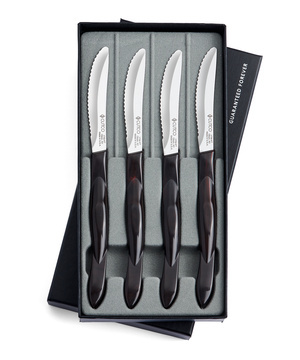 Set Savings of $6 $240 $246 if items purchased separately Six of Cutcos best-selling knife in a gift box. Cut everything on your plate and slice through even the thickest chops with ease. Stays sharp for years. A beautiful gift. Can be engraved. 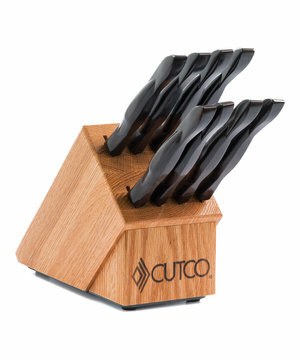 Set Savings of $19 $332 $351 if items purchased separately Six of Cutcos best-selling knife in a Honey Finish Oak Block. Cut everything on your plate and slice through even the thickest chops with ease. Stays sharp for years. 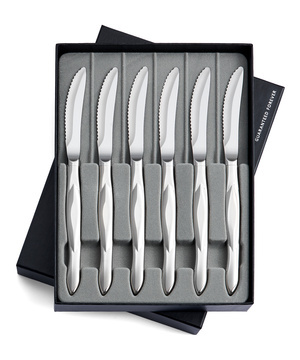 From dining room to patio, bring this block of knives with you to every meal. Set Savings of $12 $480 $492 if items purchased separately Twelve of Cutcos best-selling knife in a gift box. Cut everything on your plate and slice through even the thickest chops with ease. Stays sharp for years. A beautiful gift. Can be engraved.